Goethe Institute is hosting its first forum on dialogue, where it will be discussed as an art, a skill and a method of communication as the only non-violent way of managing conflicts. Six Myanmar panelists of varied backgrounds will be under the moderation of Dr. Thomas Henschel, founder of the Mediation Academy in Berlin. Panelists include ’88 leader U Ko Ko Gyi, performance artist Ma Ei, activist and musician Darko C and journalist Wai Yan Hpone. 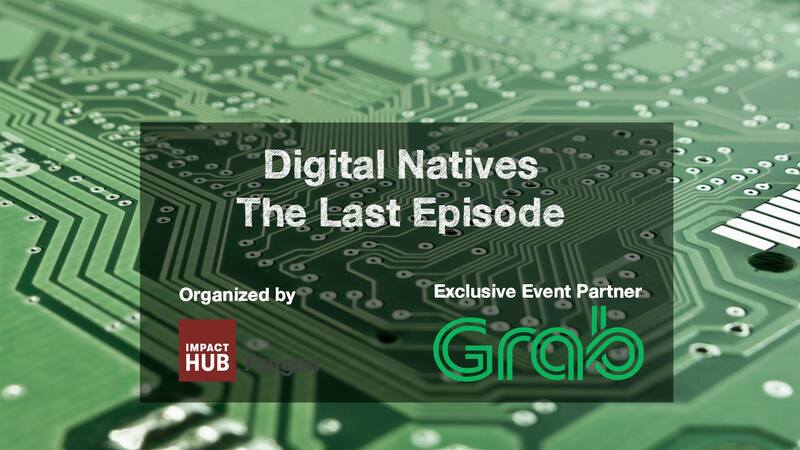 The last event in the Digital Natives series organized by Impact Hub Yaw Min Gyi in partnership with Grab Myanmar will have panelists discussing growing up as a digital native, becoming a digital entrepreneur and creating an innovative product by using digital innovations which will be followed by a networking session. Respected multi-disciplinary artist Aung Myint will exhibit a collection of his most recent paintings at Myanm/art gallery. 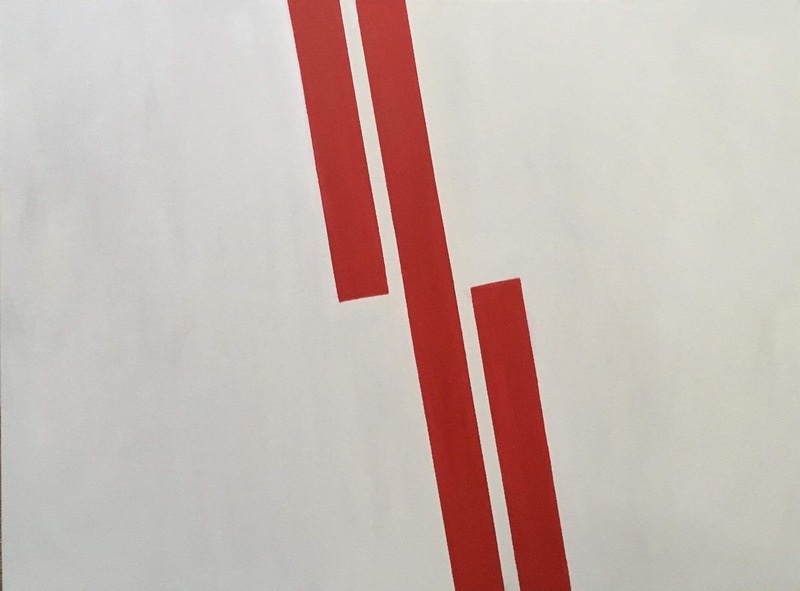 Sticking to a red, white and black color theme, Aung Myint is considered a pioneer in experimental art, rejecting traditional romanticism and confronting social and other critical issues. The exhibition opening—with coffee and mohinga—will take place at 10 a.m. on Friday Jan. 18. This five-day event is organized by Yangon City Development Committee (YCDC) in collaboration with the Myanmar Floriculturist Association. 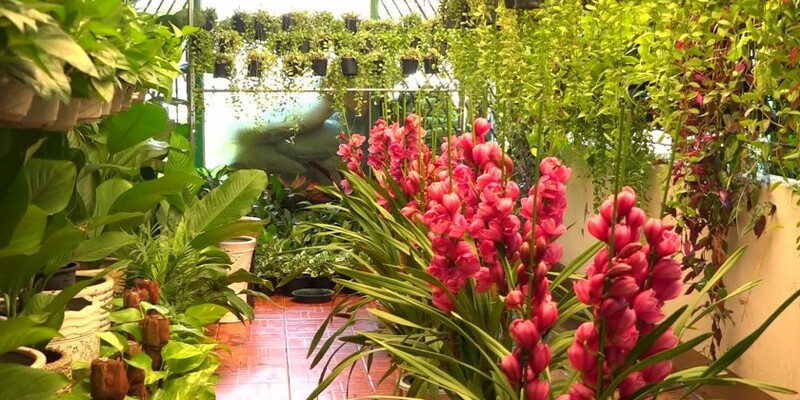 There will be 18 showrooms and 13 competition categories for a wide variety of flowers and plant species with cash prizes for the top three in each group. 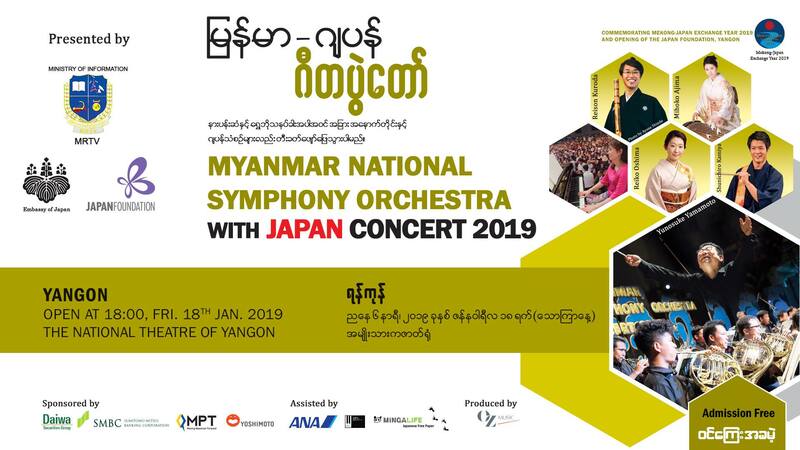 This concert is presented by MRTV, the Embassy of Japan and The Japan Foundation as part of the Mekong-Japan Exchange Year 2019 and to celebrate the opening of The Japan Foundation, Yangon. Famous Japanese musicians playing their country’s unique, traditional instruments will be accompanied by Myanmar’s spectacular National Symphony Orchestra. 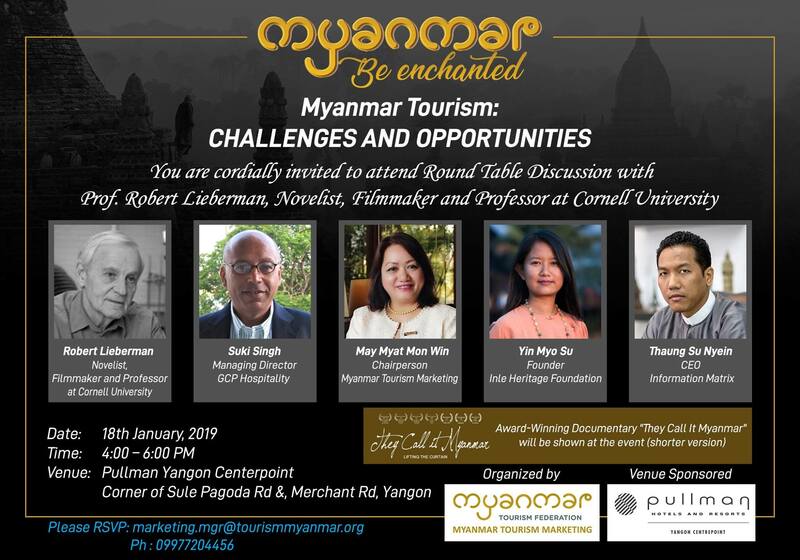 A roundtable discussion will take place with Prof. Robert H. Lieberman a novelist, filmmaker and Professor at Cornell University alongside Myanmar tourism advocates including Yin Myo Su, founder of Inle Heritage Foundation, May Myat Mon Win of Myanmar Tourism Marketing, Suki Singh, MD of GCP Hospitality and Thaung Su Nyein, CEO of Information Matrix as organized by the Myanmar Tourism Federation. The seventh edition of Pansuriya’s monthly film screening and discussion events will have a countryside theme. 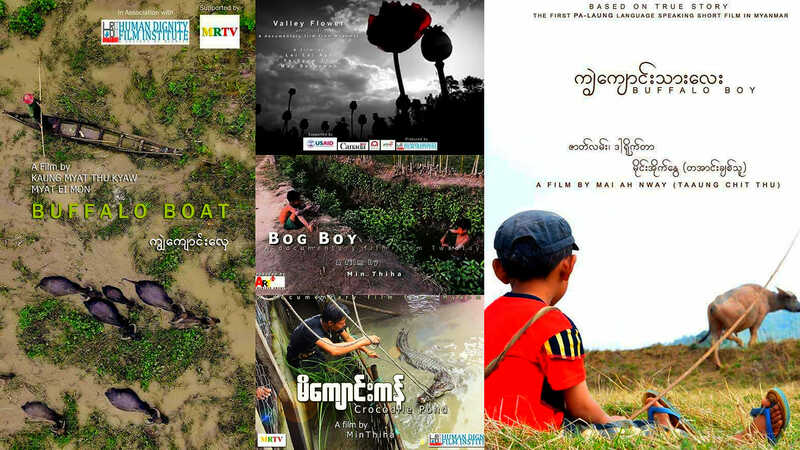 Five short films by independent Myanmar filmmakers will be screened, namely Buffalo Boat, Crocodile Pond, Big Boy, Flower Valley and Buffalo Boy, Myanmar’s first Palaung-language short film. 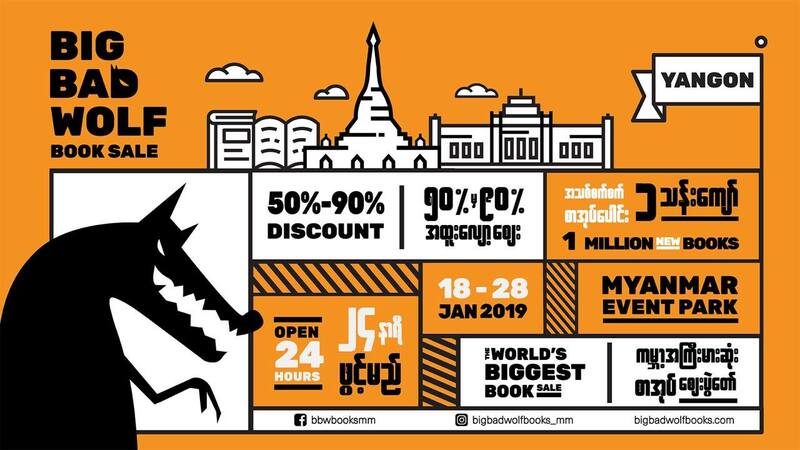 Claiming to be the world’s biggest book sale, the traveling Big Bad Wolf Book Sale has arrived in Myanmar with a selection of 1 million titles for sale and many at discounted prices. This is a 24-hour event offering English-language books of a wide variety of genres. This exhibition examining “art and the collective in Southeast Asia” is organized in collaboration between the Goethe-Institut and Bangkok Art and Culture Centre (BACC) and features contemporary art by talent from across Southeast Asia. 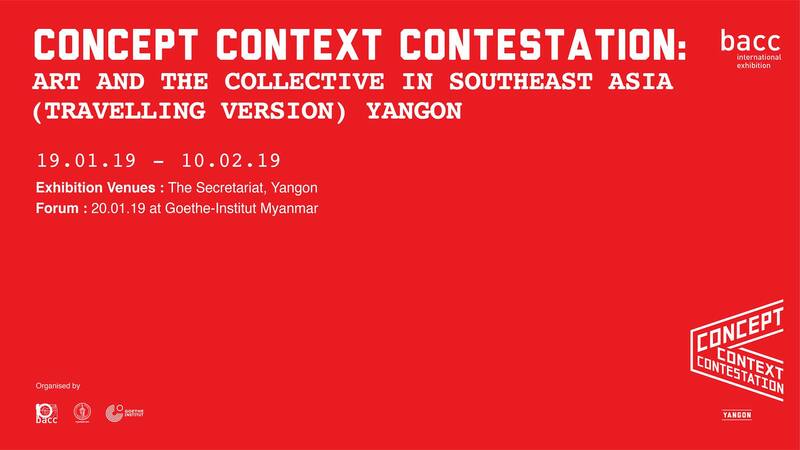 The Yangon edition of this traveling exhibition is curated by Myanm/art’s Nathalie Johnston and features 10 local artists. The opening event will take place at 2 p.m. on Saturday. Three top DJs in Yangon will play the tunes to make you move and keep you dancing late into the night. Yu KT, Hour Late and Seeger will team up for a set of fresh techno and house music at Level 2. 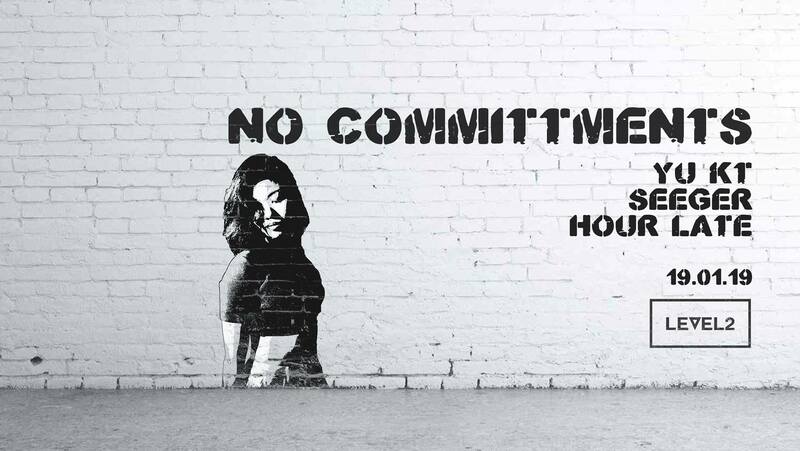 This is the first event of 2019 for the ongoing No Commitments club night. 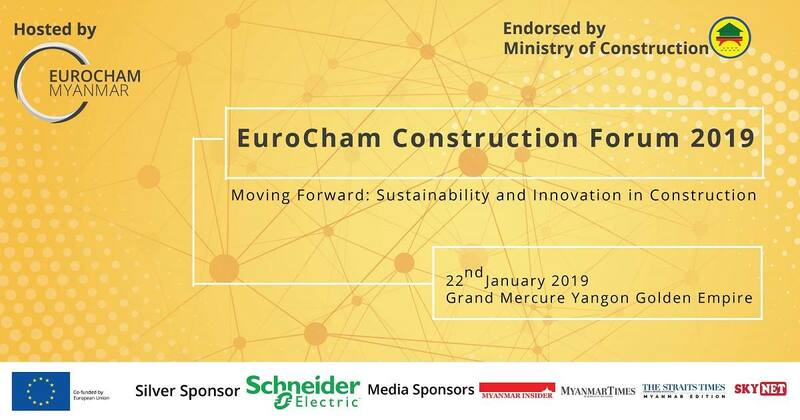 This forum will focus on three topics specific to the Myanmar context—infrastructure development, heritage preservation and building technology. Leading European construction companies will be represented by professionals with a variety of backgrounds.